The following interview took place across Skype Messenger on Sunday, September 15. Roleplayers Chronicle editor-in-chief Aaron T. Huss [shown with the prefix RPC] is speaking with Kevin Rohan of Silver Gryphon Games about AEther and the AEthermancy Kickstarter. Find out more about AEther at the Silver Gryphon Games website here. Back the AEthermancy Kickstarter campaign here. RPC: Welcome everyone to another Word in Edgewise. Today we’re talking with Kevin Rohan of Silver Gryphon Games about Æther and Kickstarter for Æthermancy. Kevin, why don’t you go ahead and start by introducing yourself and giving us a background of your RPG publishing experience. Kevin Rohan: Well, first of all, thanks for having me here, Aaron, it’s a pleasure to be here tonight. My name is Kevin Rohan and I’m one of the two co-owners for Silver Gryphon Games, a small-press publishing company that is spearheaded by myself and Ben Overmyer. We’ve been together working on Silver Gryphon Games for the better part of 6 years now, and we work on our two house systems, Æther and Ingenium, as well as supporting Savage Worlds as official licensees. My main system of choice is Æther, which has been available since 2006. I started working on it off and on through college and finished it a few years later. RPC: Can you give us a rundown of what Æther is? Kevin Rohan: Absolutely! Æther is a universal system. The mechanics are simple and easy to learn, character creation is fast, and the system is intuitive. The core mechanic is D100 based. When trying to use any skill in the system, you roll the D100, add a Base Attribute Modifier, and a Skill value. Damage is all D10 based, so the game only needs two ten-sided dice, or percentile dice, in order to play. The Core Book is geared for a modern setting to get the players themselves used to things like damage and skill checks, but you can literally do anything with it. Included in the Core Book, aside from our infamous Wellstone City setting, is a Random Setting Generator, which allows the Narrator ro determine the Time, Techonology, Genre, and Tone of the adventure. RPC: Are your Con designed adventures made for Æther? We run those Friday night, I spend the rest of the night after the adventure working on it, and I try to complete the adventure Saturday/Sunday of the Con. It’s a ton of fun, the players get their name in the adventure, and it’s a real challenge to get it written in such a short time frame! RPC: How do the d100 mechanics of Æther differ from the other major systems such as Basic Roleplaying and the RuneQuest family? Kevin Rohan: D100 mechanics come in two flavors generally; you’re either trying to shoot over a score or under a score. Percentile systems, such as BRP and the WarHammer system put out by Fantasy Flight Games, you have a skill and you need to roll UNDER that value. D100 systems have modifiers to the dice roll, (skills, etc) and you want to roll as high as possible. Several instances in Æther require a 100+ roll to be successful, but sometimes beginning characters can succeed at those with a little luck, and characters that have survived a few adventures usually have an easier time of it. RPC: How do you calculate your Target Number then if you have to roll over it? Kevin Rohan: The Skills section of the book, Chapter 2, has some guidelines for trying to assign difficulty numbers. Examples are given of what is a Basic check which doesn’t require a skill check at all, a Simple task which has a difficulty of 30, a Normal task which has a difficulty of 50, a Hard Task which has a difficulty of 100, an extreme task at 150, and up from there. Also, some skill checks are opposed rolls, so if, for example, someone rolls a Stealth skill check of 126, anyone trying to detect that character needs to roll a 127. Ties always go to the defender. RPC: So the TN is static and you add your modifiers to the roll instead of the TN? Kevin Rohan: Some of both. Let’s take Lock Picking as an example. If a PC is trying to pick a slightly advanced modern lock, the difficulty to do so might be 100. If the PC has tools at his or her disposal, lock picks or even something improvised, they will get a +10 or +15 bonus, depending on the tools. If the lock has been made to be harder to pick, the difficulty will go up. If the tools snap in the lock, the difficulty will go up. If the PC has tools that are ill-suited to the job, they would get a penalty for doing so. Of course, at that point, they might just break out the univeral key (Sledge Hammer or Bolt Cutters) and just bypass it completely. RPC: When you consider Attributes and Skills, are they tied together or are you allowed to combine them in different ways to create different functions? Kevin Rohan: Yes and yes. Attributes give a modifier for a Base Attribute Modifier to a specific set of skills. For example, there are whole blocks of skills that fall under Academics, Aim, Appearance, Muscle, Reflexes, Toughness, Will, and Wits, which are the eight attributes of the game. Generally speaking, skills don’t stray from those Attributes, but if you wanted to just throw something far, not caring about accuracy, then the Base Attribute Modifier for Muscle would apply, not Aim. Intimidation can work in the same manner; you could use a feat of strength in order to intimidate an opponent instead of using your Appearance to do so, or you could use Wits and your Politics skill to tell them just how much trouble they are in for whatever they did. RPC: Considering just the core rulebook and your statement that it’s essentially designed for modern settings, is it more conducive to modern action or modern fantasy? In other words, is the focus on technology options or do you have an extensive magic system? What about a system for horror? Kevin Rohan: Well, I’m glad you asked about that, Aaron. The Core Book is just the system core; there isn’t any magic or cybernetics in it. There are rules for going insane and temporary attribute loss which help open the door for some darker horror type games. Several of the first playtests have actually been horror-esque with C’tholonic terrors and beasts and it worked beautifully within the existing skill system and mechanics. Magic gets trickier. We are actually holding a Kickstarter right now, going through October 12th of this year, and that is to get the Magic book, Æthermancy, funded so we can make it the best product we can. Magic functions off the skill system and the book encompasses all types of spell casters, magic users, psychics, and even things like Shaolin monks, anime wizards, and especially typical fantasy tropes like wizards and clerics. Each “class” becomes an archetype in Æther and the player chooses which Attribute will be the character’s Casting Attribute, which naturally helps decide what type of caster they are playing. Wizards are typically Academics based, Clerics would be Will based, Sorcerers would typically be Wits based, and so on. Kevin Rohan: Shamans could be a few attributes, depending on what exactly you’re trying to do with them. If they need to commune with the Spirits, I could see them being Appearance based, but there could be arguements made for knowing exactly what the spirits need to do the magic themselves and they could be Academics based. They could also be more spiritual like a typical Cleric and work through Will power as they try to push the spirits to do their bidding. Much like Savage Worlds, it comes down to trappings. Æther can be about finding that best fit for what the character is trying to do, then framing that with the mechanics. RPC: Is Æther a class-based system? Kevin Rohan: It is not. It is a skill based system. However, there are still archetypes that can be chosen, and while they’re not structured classes, they are definitely paths that can be taken. One of the things that seems to excite people the most about that is that if you want to play a fantasy wizard, you’re not stuck with reduced hit points or being bad at fighting. RPC: Thus the players have the ultimate freedom to create the character how they want…? Kevin Rohan: Yes. Advancement is driven by skill point choices, and the players can make all kinds of choices at advancement, picking up a wide range of skills so they’re not limited, or they could chose to focus in one area over another. Kevin Rohan: I’m very okay with that, Aaron. I set out to design a system that was fun to play, didn’t limit your choices, but still made you choose and focus where you wanted your character to go. RPC: How does Æther handle health/hit points? Kevin Rohan: Æther can be a very lethal system in that respect, but it works out for some great stories to be told later. As I mentioned before, Toughness is one of the eight Attributes. A character has his or her Toughness Attribute in life points. They can go to that value below zero before they are dead, but they start taking more and more penalties the further below zero they are. Humans in Æther, unassisted by magic or technology, have attributes that range from 1 to 10. Average is a 3. So, the Average Human, with 3 Toughness has 3 life points and can go to -3 life before he kicks the bucket. Using that modern framework as an example, a 9mm does 1d10 – 1 Hard Damage. Armor can soak up some of that damage, as can cover. Kevin Rohan: Surprisingly no! There’s another feature of the system that really helps balance that out, and that is the Luck system. Luck isn’t an attribute, it’s purchased with skill points either during creation or at advancement, and it’s an expendable resource. It can be used to add 50 to a dice roll before it is rolled, the player can use a point to re-roll a dice roll of their own, they can use it to force the Narrator to re-roll a dice roll, or they can use it for Not Dead Yet. Not Dead Yet means they are a half of a point of life away from dead, but they are stable and not bleeding out. It can be used for anything at any time…so if the characters were on a 747 that crashed into an active volcano, they could burn that last, precious point of Luck for Not Dead Yet and survive the crash. Getting off the volcano and back to civilization might be a different story entirely though! RPC: Does the Æthermancy book adjust those attributes to embrace the heroic themes of epic fantasy? Kevin Rohan: Epic fantasy is addressed in the book, and some creatures and races go up higher in some attributes but may be restricted in others due to racial penalties and other tropes that we’re all familiar with in fantasy settings. There are also spells that modify attributes, as well as things like Lycanthropy which adds to a character’s Muscle, Reflexes, and Toughness inherently, and then they get another bonus when the character is in lycanthropic form. One of our last adventures, Adventure in a Con: Legend of the One-Toes, had the PCs playing a certain race of cavemen that are basically giants. They started out with higher than average Muscle and Toughness attributes, but lower than normal Appearance and Academics attributes. RPC: Considering epic fantasy and fantasy horror, which often feature huge, powerful creatures, how do you scale the Æther system to allow the PCs to survive those encounters? Kevin Rohan: Carefully! Seriously though, it’s up to the PCs to decide that. 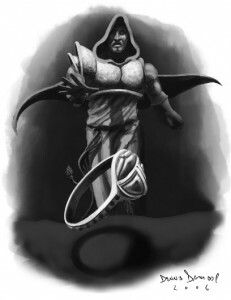 Æther is a gritty system and while using Æthermancy can greatly assist in fighting Vampires, Golems, and Elementals, it is still up to the players to use their heads, use their characters’ abilities to the utmost, and try to bend the situation in their favor. RPC: Let’s talk about the Kickstarter now. What part of Æthermancy are you funding with Kickstarter? Kevin Rohan: The funding from the Kickstarter is basically entirely funding the art for the book. 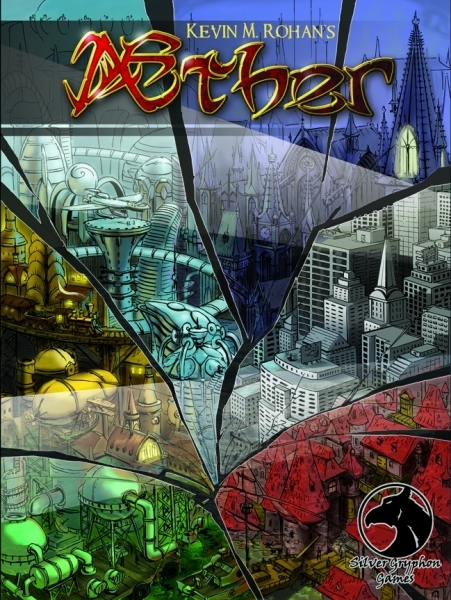 We are also going to make sure that we get this one into the hands of distributors so we will be getting an ISBN for it (and appropriate barcode) so it can be found in your FLGS along with Æther, which we have already gotten an ISBN for and are in the process of finalizing for distribution. Of course, there’s taxes and fees which need to be met as well, but the art still composes the largest financial hurdle for us, and the same is true or each of our stretch goals that we are anxious to fund as well! RPC: Is the book already written? Kevin Rohan: A vast majority of it is already written yes. I keep thinking of more cool things to add to it and keep tweaking it. Eventually I’ll have to stop, but for now, until I feel it’s “done” then I’ll keep tinkering. We have a tentative ship date of Februrary for the funded project, so I imagine that by December 1st, I’ll have to stop working on it and put in the final art. RPC: Do you have a back-up plan if the Kickstarter doesn’t fund? Kevin Rohan: Well, if it doesn’t fund, Æthermancy will probably still be published at some point, though it won’t be nearly as awesome as it could be. We’re really looking to put the polish on this one and put out a product that will set a new standard for what we want our products to look like. 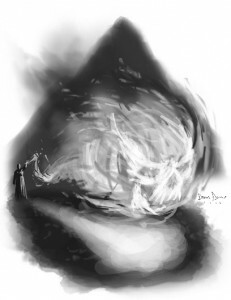 However, if we don’t hit the stretch goals, that information such as the expanded archetypes, various elemental based spells, necromancy, healing, summoning, expanded creature catalogs, and so very much more will probably never see the light of day, or it could be years down the road before it’s published. RPC: That’s all I have for questions today Kevin. Do you have anything you’d like to add? Kevin Rohan: I would like to say that we’re watching that Kickstarter like a hawk. We like to pride ourselves on our customer service and our openness and our willingness to talk with our customers. We love getting emails, and we love interracting with our customers via facebook, Twitter, and a growing G+ community. The Kickstarter is the ultimate extension of that; it tells us that our customers not only love what we have done so far, but that they want more of it, and they want to push us to be even better than we have ever been before. And for that, we thank our customers. They are what makes being an Independent RPG company so awesome! I’d also like to thank you again for having me on here with you, Aaron, it’s been a blast to talk about this project that I love so much and love to share with the gaming community! RPC: Thanks for taking some time to chat with me!